Here are 10 more breaking the code words with a St. Paddy's Day theme. Engages students' brains, activates problem solving strategies as kids must break the alphabet code used to make the cryptolist. 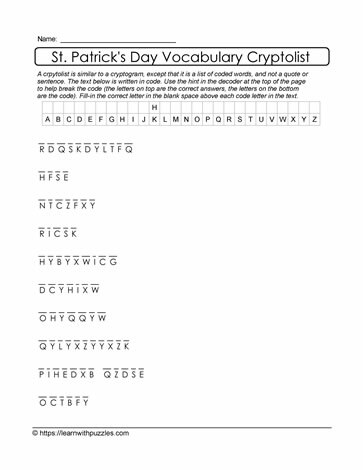 A Cryptolist is list of words, in this case St. Patrick's Day related words, that have been encrypted using letters of the alphabet. To solve the puzzle, decrypt the letter substitutions and use the grid at the top of the page to track the substitutions.